The Victorians were into some weird stuff but one thing that could stand to make a comeback is a subgenre of speculative fiction called “utopian romance.” These books were somewhat light on plot and spent most of their pages describing utopian futures where everything you could ever want or need was directly at your finger tips. I suppose that is as good a way as any to work through the existential angst that persists in the face of incredible violence mixed with the lavishness of global empire. One person that was not too keen on these novels was a legal stenographer by the name of Ebenezer Howard. He was reading one such utopian romance called Looking Backward by Edward Bellamy which described something akin to Amazon: an enormous network of hyper-efficient delivery systems that could get you just about anything you want nearly as soon as you wanted it. Unfortunately for Howard he could not partake in the excitement about this new novel because he kept getting caught up in the details: What was keeping these supply routes running? Who made all of that possible and what was keeping them from going on strike, raising prices, or demanding some sort of unimaginably high concession from the rest of the world to keep the supplies flowing? These questions plagued Howard so much that it drove him to create a whole new profession that has touched just about every city on the planet: urban planning. And now here we are, in the future, and Amazon wants to surpass the speed of human delivery systems by using drones to airdrop our orders. I won’t pretend that such a prospect is uninteresting to me. I want robots to do my bidding as much as the next guy, but our history with labor-saving robots has been sketchy at best. We’ve been here before and there are lots of predictably bad outcomes from automation. Amazon’s promo videos for their drone service conveniently obscure the humans in their warehouses and only show happy customers. Unless entire production lines are automated there is inevitably someone somewhere trying to keep up with the inhuman tempo. And if the suffering human isn’t in one production line, they are somewhere else in the production chain, either providing the raw materials or receiving the finished products. In any case the story remains the same: Human labor is rarely saved in a way that is good for a worker. No single worker in an automated factory is working less or more comfortably, rather there are fewer workers doing more repetitive tasks faster than ever before. David Noble, in America By Design showed that automation, when it is first implemented, is never as efficient or cheap as the human labor it supplanted. It takes years before assembly lines reach the quality and efficiency of human assembly lines and so the loss in productivity can be seen as a down payment on a smaller, more pliable workforce. Robots do not need health insurance, retirement packages, or break rooms. This dynamic can even be found in spaces that too few people are willing to acknowledge even contain workers: home kitchens. Home appliances, as Ruth Schwartz Cowan famously observed, never reduced housewives’ labor. Instead, the amount of work expected of them increased. Rather than cooking a meal and repairing some socks, a day’s work involved multiple meals, a spotless house, and several loads of laundry. If the past is prelude then the drones that replace your delivery person will probably be good enough. That is, the automated portions of the delivery system will work enough of the time that few customers will drop the service while engineers perfect the drones and the delivery person’s union loses its appeal in court. Legal and technical timeframes are both taken into account in this sort of transition. Write-ups on automated delivery like the one that ran in The Verge last January, cast regulations as something in the way of an inevitable future. Regulations are “holding back” exciting new developments. And on one level that’s true, although I would say that is a good thing even though the wording of such articles clearly begin and end with the opposite assumption. What’s even more frustrating is that all the regulations that do stand “in the way” of drone delivery are safety regulations for flying aircraft. While safely rolling out an automated fleet of drones is important, no one is asking if the roll out should happen at all. How will this impact Amazon’s notoriously sad and overworked employees or the employees of competing firms? Transportation is an enormous sector of the economy and delivery in private and public organizations constitute some of the largest unionized workforces. The prospect of replacing one of the biggest employment opportunities in North America with drones should at least merit a public conversation. If we think of global just-in-time supply chains, for example, these are economically efficient under capitalism, but also exceptionally effective in breaking the power of unions. In other words, hegemony, or rule by the engineering of consent, is as much a material force as it is a social one. It is something embedded in human minds, social and political organizations, individual technologies and the built environment that constitutes our world. Hegemony, a theory developed by the Italian author Antonio Gramsci, tries to make sense of the fact that while capitalism benefits a relatively small elite it has many champions who are actually on the losing end. Gramsci argues that capitalism’s staying power resides in its ability to appear as common sense. Most of us don’t think twice about the relationship between hard work and material comfort, the former is simply a prerequisite for the latter. Drones, of course, make this all very confusing because on the one hand they are taking away opportunities to work but they are also the product of engineers’ work. We resolve this seeming paradox by creating a hierarchy of whose work is more desirable: the creative and complex labor of building machines is valorized while the grunt work of delivering packages is cast as respectable but not something to aspire toward. Hegemony is much more than ham-fisted propaganda: it is lived experience. Or, as cultural theorist Raymond Williams puts it, hegemony is “a set of meanings and values which as they are experienced, as practices appear as reciprocally confirming.” We are not merely encouraged to strengthen the power of managers and put workers out of the job, we are surrounded by a world in which every marker of encourages us to destabilize other people’s means of subsistence while increasing the power of elites. If I sound conspiratorial it is because a crucial part of hegemony is making detractors sound like tin-foil hat-wearers. And of course, even saying that just makes me sound like I’m typing from within a faraday cage. Srnicek and Williams point toward a way out of all this and it involves nothing less than undoing common sense itself. They prescribe a broad, long-term strategy that in many ways retreads the path that free-market radicals took in the 80s. We need new narratives of individual success and societal triumph. We must, as their title implies, invent a new kind of future that puts justice and dignity at the center, not growth for its own sake. Editor for @cyborgology. @ttw_conf committee member. PhD student in STS. Building the new in the shell of the old. It is a long journey and we are taking the first steps. Life is a process of taking the available materials and energies and utilizing them for subsistence. As with any species our bodies and minds developed to utilize availabilities for our necessities. Our food grew naturally and our shelter was part of the environment. The automation our current environment with factories and delivery services and robotic servicing of our necessities is an intricate process, very far yet from the completion we need, to return to the original integration of our needs with an artificially perfect environment. The concept of a civilization wherein only a small sector of humanity was free in the way that primitive humans were free to live on what the environment provided and the rest were enslaved by force or wages to provide this freedom to the privileged is beginning to end and the economic systems are beginning to react. Finland and Denmark are already considering donating money to all citizens for sustenance without work since jobs are disappearing. But there are drawbacks. Our bodies and our minds vitally need some form of exercise to remain healthy. Without some way to see to this dynamic humanity will decay and cease to exist. There are many ways to see to this in occupation that is delightful and also somehow necessary. That is the element that must be developed and disseminated throughout our civilization if it is to continue to exist. Not all deliveries of Amazon products are union employees. That would be for UPS employees, and not the contractors and employee drivers at FedEx Ground. I contracted with FedEx for 12 years and now currently drive for another contractor after being forced to sell my contracted route because of the implementation of a new business model at FedEx Ground. 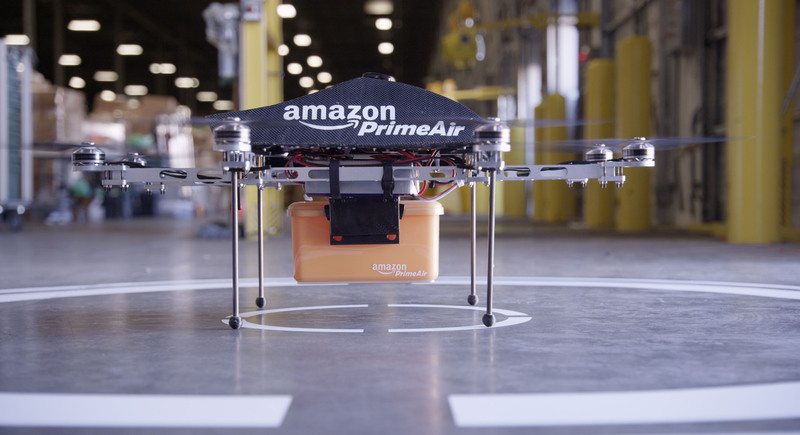 Loss of Amazon deliveries could have a big impact on contractors and their drivers if FedEx Ground can’t find a way to replace lost business from the drone program. Many drivers of contractors get no health insurance benefits, and increases in pay, it at all, are small. I haven’t had an increase in salary in 3 years. I hope when people discuss the drone program, that they can also include us in the conversation. It probably means more to us than the unionized drivers at UPS. Thanks for a great post and the chance to comment on the drone program. All good points! Unionized drivers are in the best position and even that position is extremely tenuous. You are right to bring up the simple but over-looked fact that most private delivery companies are also relying on contract labor that has very little if any protections for the worker. Unions were effective organizations when the cessation of worker activity was an effective weapon to encourage employers to grant decent wages and working conditions but automation and aggressive anti-union legislation in the USA has destroyed that ploy and many union officials are now oriented towards cooperating with the employers in their anti-worker agendas which not only destroys a decent life for the workers but destroys the general compensation which makes production worthwhile for the weakened market. I just watched a couple of episodes of the BBC show Click as they talked about the future of robots, which drones would fall under. Some of the experts wonder how society will cope with the increase of robots along with the likely increase in unemployment. At what point will there be a citizen wage, as they termed it. I remember 40 years ago debating the question of what will man do when the Jentsons become real, well I guess we are not at that point, well at the point as to when we need to really start to talk about the future. Another interesting related topic was on when large parts of society are bored or restless they often get up to mischief, are we also ready those possibilities. Going to be a very interesting few decades, thanks for the post. Another way of looking at drones is surely as a new means of transport rather than of a human labour replacing form of robotics? Isn’t replacing delivery vans with drones analogous to replacing barges with trains? Or trains with cars? Or cars with planes? All modes at some level require drivers or pilots (or programmers even! ), and whatever loads and unloads at either end would remain largely unaffected. I worry that some of these fears of progression are predicated on the irrational fear of change in the Luddite fashion. The whole point of these drones is that they do not require drivers or pilots. Sure but you need far fewer programmers than drivers and unless you’re funding free training in programming for out-of-work delivery people this doesn’t really matter. whatever loads and unloads at either end would remain largely unaffected. I state in the essay that this is untrue. acknowledged, and your much better researched in that area than I am. However, bemoaning potential unemployment should not stand in the way of progress. It’s the same as those that broke industrial looms with clogs (sabo’s) the origin of the term sabotage or saboteur. New technology brings new opportunity and with it new industry. Same deal with clean technologies I guess. Ask redundant coal miners about solar power for instance. Good essay though, and I didn’t intend to wholesale disagree with it. Just come from a different angle. Thanks! I appreciate you engaging with the ideas presented. I’m wondering what your definition of progress is because I don’t see anything going on with Amazon’s drones as social progress. Technological innovation definitely, but not progress. Id tend to agree on progress to date. Though the concept is adventurous and interesting, though granted much less successful than their larger weaponised brethren. Perhaps a look at http://www.fairobserver.com/region/north_america/obamas-war-the-failure-of-drone-strikes/ might revise your admiration of the drone military effort. Sorry, never meant to send that without finishing! They either have cameras, weapons, or carry packages. If you measure there affective see at bombing IS you might praise them, though they are also great at indiscriminately killing civilians… And they remove a layer of Human interaction and feeling of accountability from the decision making. But as with many technologies, warfare is the frontier of their development. That’s on the level of “guns don’t kill people, people kill people”. It’s how a tool is used that creates good or evil. I agree that if drones are more efficient for delivery they inevitably will be used but then a real effort must be made to provide income for those who need jobs. Without people with income, the economy must inevitably fail and the whole country suffers. Great insight in that we have to rethink what we accept as common sense. We do have to look at the human cost of the technology like you said, but I think looking at the human aspect from the opposite end of the drone is important too. What have we become when our appetite for cheap and instant goods to consume leads to a market in which this happens? The objection to a fast and economical delivery service is that it puts people out of work in a society offers fewer and fewer means of making a living. The problem is not the innovative delivery service, it is that society does not see to it that we reach can earn a decent living. That is a separate problem. When a society is totally devoted to rewarding profit making enterprise to the point if neglecting the fundamentals of maintaining the necessary fundamental infrastructure and the health, education, and basics of survival of its population it is a failing society and it is only a matter of time before the population is forced to search for alternatives in order to survive. US society is now on the edge of some kind of reaction to make some kind of major change. The dynamics of that kind of change are frequently chaotic and cataclysmic and as a US citizen I can only view the near future with despair since the controlling forces of the country are not reacting either decently nor sensibly to the the patterns of great danger. Reblogged this on Miyo´s General Blog. When Amazon drones do come out, it’s just going to be like that South Park episode. I do like the idea of robotics, yet so it does have its pros and cons. One major con is that in the future more robotics are going to be replacing human labour, which will mean larger rates of unemployment and more people of welfare state benefits. However, I do think it is hard to predict when robotics will become a large scale device in society and when it will start dominating human resources. I drove for Uber for a while. They treat workers about the same way Amazon does. After reading this I see why. Their platform caters to immediacy and is cheaper than the taxi, which admittedly had many problems and had not innovated as an industry for a century. People love using Uber, but it’s at an expense to the drivers who aren’t given enough in the deal. If anything they ought to be paid better than taxi drivers. Of course it’s moot if cars become fully automated; Uber can outsource the driving to robots someday. Or, maybe they’ll just make a bigger drone and drop you where you want to go like a cable-less ski lift. All because of hegemony. Thanks for this article, I feel it’s really helped me understand that concept much better. Great work.